For the last several months, since Beyond Barbie ended, I've been unclear about what my next step should/could be (as I've written about here several times already). I haven't felt like creating large paintings, or, for that matter, any paintings at all. It was a bit scary to go from a time period of such extreme creativity to this dearth of ideas. 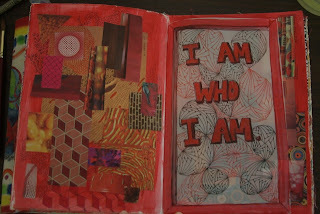 Out of this time of "not knowing", I felt led to create a journal/sketchbook which I have been using almost daily. I go into the studio where I have pulled out almost all of the art supplies I own (yes, what a mess!) and let the muse take me. My mantra is "I wonder what would happen if..." then I allow myself to find out. 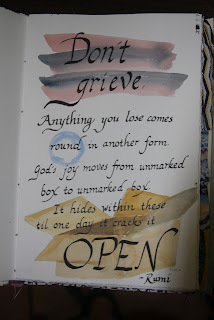 Sometimes I write inspirational quotes in calligraphy. Sometimes I play with paint. Sometimes I doodle with patterns. Sometimes I paint flowers. Every day it's something different, but it's always interesting to me, and, almost magically, it is lifting the fog I'd found myself in. I'm finding it to be an incredible tool for self exploration. Because it's been so powerful for me, I feel led to offer it to others. The format I've come up with is a bit unorthodox - first we'll meet over a weekend, Oct 6th and 7th, to create the journals themselves - yes! We will prepare the paper, make the cover, and bind the books ourselves! Then we'll meet Monday evenings for six weeks to fill the journals. The class will be skill-based in that you'll learn to make a book, and you may learn some skills in exploring different media, but it'll also be about personal exploration and opening to your creativity. This course will take you wherever you choose to go! 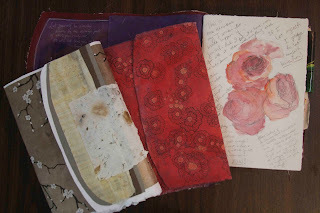 Three of the handmade journals I've created as part of this process. Below I've pasted the blurb from my website so you can get the whole story. Please contact me if you are interested, have questions, or would like to sign up. I sense the class will fill quickly, so follow your urge, and sign up soon! 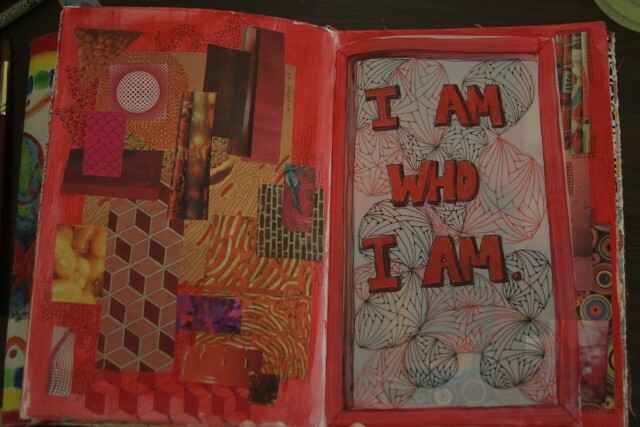 Because our analytical brains (words and thoughts) sometimes get in the way of accessing insights, it can be helpful to take a visual approach to journaling to allow our more intuitive selves to emerge and teach us. To sign up: Contact Susan Singer at SusanSingerArt@msn.com or 804-267-3455 to sign up or with questions. Location: Susan Singer’s studio off Huguenot Rd. near Stony Point.